The city's public transportation system consists of buses operated by Stagecoach Auckland, a limited train service and regular ferries, which travel to Devonport and the beautiful Hauraki Gulf Islands. Central Auckland is made up of a fairly organised gridwork of roads and travelling around the city centre is generally easy. 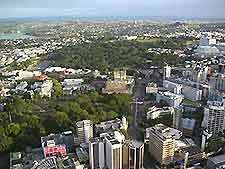 The city of Auckland has good connections throughout the North Island of New Zealand and is situated close to countless interesting suburbs, towns, regional parks and mountainous regions. Renting a car is often the most inexpensive and convenient method of travel and transport for excursions outside of the city. Many outlying places of interest can be reached in less than one or two hours by car. Auckland is home to New Zealand's largest airport and Auckland Airport (AKL) is located just 20 km / 12.5 miles to the south of the city centre. This important, busy airport deals with huge numbers of passengers throughout the year and has excellent, modern facilities. 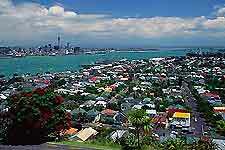 New Zealand's largest city is served by a number of major roads and highways. Connecting Auckland to many parts of New Zealand, road access is excellent and renting a car provides one of the best ways to travel outside of the city. Parking in downtown Auckland is often rather limited and time limits in central car parking spaces can be fairly short. Traffic is at its busiest during the commuting hours (07:30 to 10:00 and 16:00 to 18:00), therefore travelling by car outside of these peak hours in the city centre is most sensible. Buses are operated by Stagecoach Auckland and travel in a continuous loop throughout the city. These buses depart every ten minutes during weekdays and every 20 minutes at weekends, and travel to many areas of the city, including Parnell, Newmarket, K' Road and Ponsonby. Buses marked 'Downtown' terminate along lower Queen Street and buses marked 'Midtown' end at the corner of Queen Street and Victoria Street. Bus fares in Auckland, other than Link buses, are calculated using a zonal system, with the inner city areas of Parnell, Mount Eden and Ponsonby being 'Zone 1', Newmarket being located in 'Zone 2', right out to Henderson in 'Zone 5'. The Auckland Explorer buses provide a popular alternative way to travel around the city centre, with convenient hop-on / hop-off tickets. Auckland is home to a fairly basic and limited train service known as the Tranz Metro. Featuring two main lines, which travel south the Papakura and west to Waitakere, the city's train station can be found on Beach Road. Ferries in Auckland provide a fast, pleasurable and very scenic way to travel along the coast. 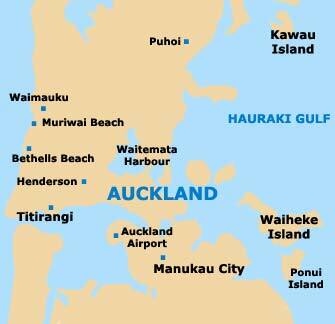 Most ferries depart from the central Waitemata Harbour and travel to the Hauraki Gulf islands and to nearby Devonport. Auckland is well pedestrianised and one of the most easiest ways to travel around the organised city centre is by foot. Walking around the city is an excellent way to view many of the numerous tourist attractions, museums, galleries and landmarks. Finding your way around the city of Auckland is quite straightforward and the most famous sights are often situated close to each other. Taxis in Auckland are one of the most popular ways to travel around the city and nearby areas of New Zealand's North Island. The numerous cabs operate from many central taxi ranks and can also be easily hailed on the street, or even ordered by telephone. The Auckland Taxi Co-Op is one of the largest taxi firms in the city. Cycling is a particularly popular way to travel around the numerous recreational areas of Auckland, although some parts of the city can be quite hilly. Much of central Auckland is extremely suitable for cycling and popular cycle trails include the harbourside Tamaki Drive, which is situated to the east of the city centre and forms part of a 50 km / 31 mile cycle route.